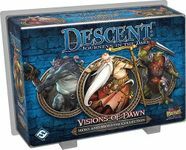 This is the first expansion for Descent. 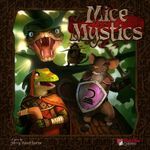 It includes new monsters (with figures), heroes, treasures, effects, scenarios, props, and more! It also features options for the Overlord player to customize his deck for each scenario. Deep in the bowels of the world, there lies a chasm that was sealed over a millennium ago. Within it lies a force of evil so great that, were it to be unleashed, it would plunge the world into a thousand years of darkness. Before you can face that challenge, however, you'll battle your way through dank tunnels, trapped temples, and even volcanoes to prove your worth. You'll face a host of new tricks, traps, and other lethal obstacles over the course of your quest, including scything blades, rolling boulders, and boiling hot lava. 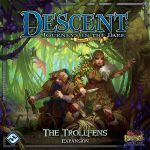 Descent: the Well of Darkness features six new heroes, tricky kobolds, bloodsucking ferrox, and unstoppable golems. Heroes will find more skill and treasures at their disposal, including six new relics and a new type of potion. The Overlord, on the other hand, gains the ability to customize his deck before every game, putting in devastating new trap, event, and spawn cards.